Recently, Carol and I read in the paper that West Lebanon’s Four Aces Diner had reopened. The Four Aces has had a bit of a rough history. 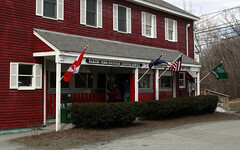 A genuine Worcester Diner (#837), it originally was located downtown, but after a fire was relocated to its current location at 23 Bridge St (and is now enclosed by a surrounding building). Since I moved to the area, in 2001, it’s been leased out to several different operators. After closing up shop in 2008, it reopened as a “more upscale eatery” in 2009, but I wasn’t impressed (for my meal, “upscale” apparently mean “benedict with cold deli ham, broken sauce, and runny eggs”) and didn’t go back. After a bit more than a year that owner packed it in as well, and the Four Aces went on the market. Apparently (I’m going off of recollection here, damn the Valley News and it’s near-complete lack of online articles…), the building owner (the Shorey family) decided that the business would be more valuable if it was a going concern, so they reopened the Four Aces, moved the Elvis kitsch back in, and starting dishing out food again. And it’s been a real improvement. The menu is back to more-or-less its old self, featuring a wide variety of classic diner dishes (breakfast combos, burgers, melts, etc). They gave the place a good cleaning, fixed up some of the booths (sitting on duct-taped booth cushions was part of the charm when we started going there in 2001), and have been making a go of it. So last weekend we decided to drop in and try it out. We immediately noticed the place was busy, which is always a good sign (the Upper Valley has a definite shortage of breakfast places, in any case). Looking over the menu, I was happy to see most of my old favorites there (biscuits and gravy, patty melt, …), I was tempted by the breakfast special. So I ordered the Irish Breakfast (being a few days after St Patrick’s Day, I suspect this was the “leftover special”): an Irish banger, eggs, homefries and bubbles and squeak, beans, and a biscuit (which suffered from the “New England Biscuit Malaise”, but only a mild case thereof). 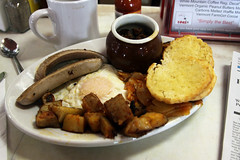 The banger was nicely grilled, the home fries nicely cooked but crisp, the bubbles and squeak spot on (not too salty or greasy) and the baked beans full of New England goodness. In short, everything was nicely done, and it was a rather nice start to my day. Then, the next set of owners (in 2009) didn’t even have waffles on the menu. The current owners restored waffles to the menu…. and have a new waffle iron! The result was a pleasantly done waffle with a nice apple crumble, and some soft serve. 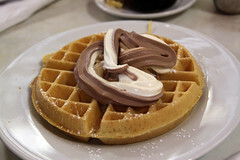 It wasn’t as good as Woodstock’s Mountain Creamery waffle with ice cream, but certainly good enough. So we’re happy to see the Aces up and running again. Hopefully it can continue a successful run in West Leb.